My 2013 Kindle Paperwhit e arrived yesterday and now that I have spent a few hours with it I can confirm that the early gushing reviews weren't wrong; this is a nicely improved ereader. I would not go so far as to say that it is now great and wonderful, but I can see that Amazon polished some of the rough edges and refined the design. I have both model years sitting on my desk, and when they are sitting there powered off it's almost impossible to tell the difference. Last year's model is more scuffed but that is merely age and use; had they come out of the box on the same day it would be easy to confuse them. 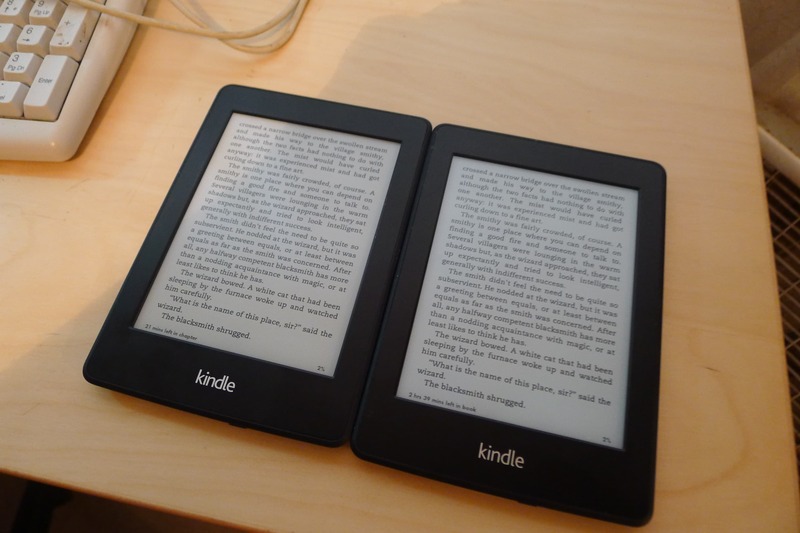 The new model has a slightly blacker shell and the word Kindle is printed in a less-bold font, but just about the only way to tell the difference is to flip them over. The 2012 model says Kindle on the back while the 2013 model says Amazon (the FCC statement is also different). But while the differences aren't visible at first once I turned them on I immediately knew which was which. You turned on last year's model by pressing the power button; the new KPW requires that you also swipe the screen. Update: A reader pointed out that the extra swipe was probably due to one device having ads and the other not having ads. Thanks, Anne! And once they're on the differences are more obvious - except for the screen. The 2013 KPW has a screen that is at times slightly whiter and slightly grayer than the screen on last year's model. I know it sounds weird but that's what I am seeing. I think whatever new tech E-ink added to the 4th-gen Carta might still need the bugs worked out because it is not a clear and obvious improvement over the previous generation. Update: I'm told that the issue I was seeing before was the result of a partial screen refresh. I turned it off and now I think that there is very little difference between the screens. But once I got to using the new KPW I was able to see how it had been improved. The biggest difference is in the speed. The 2013 KPW is noticeably faster to turn the page, and it is also more responsive in the menus. How much faster? Well, when I was testing it I noted that the new model was done turning the page before the old model even started to turn the page. It's that much faster. And then I turned on the frontlight and the difference became even more clear. My 2012 KPW has a very splotchy frontlight, while the 2013 model has a much more evenly lit frontlight. It was also visibly brighter. These details might not be visible in the photo but they can be seen with the naked eye. All in all, this is a nicely improved ereader. If you were thinking about getting last year's KPW I suggest that you get this one instead - even if you have to wait for it. I also feel that the new model is worth upgrading to (assuming you can resell or rehome last year's KPW). Update: My competition isn't all that impressed with the KPW, and he can't really see any improvement to the Carta screen. He recommends against upgrading. P.S. In the long run the 2 models will probably have the same software features thanks to Amazon's policy of updating old Kindles long after they've been replace. That means the cool new features like Goodreads integration and Freetime (for kids) aren't affecting my decision. P.P.S. It is very nice. But do you know what would make it better? A 6.8" screen. You last year’s model must not have special offers, if you don’t have to tap or swipe the screen. I guess it doesn’t. I can’t recall paying extra but you’re right in that it doesn’t have ads. Thanks for the correction. You’re welcome. I plan to buy out the ads on my new one, so I do hope no swiping or tapping will be required, once I do so. 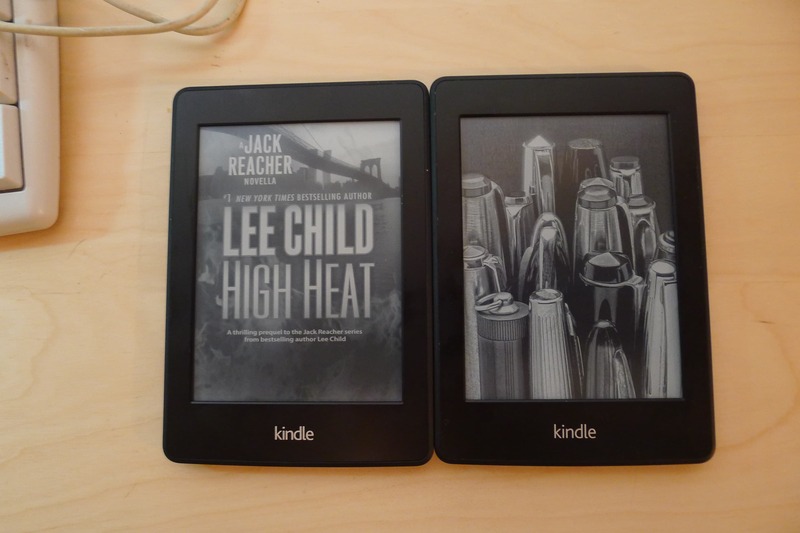 So is it better than the new Kobo or Nook? new Kobo, old Nook. I probably should have put a comma after the word Kobo to clarify. There is no working jailbreak for the KPW2. Neither for the new Kindle Paperwhite (1) OS Update, imho. I found the search functions sounded interesting, wether they are or not. So I installed the upgrade and lost the jailbreak. The different Fonts still work though. Regarding the screen: both grayer and whiter? How? How is it with the light off? I looked at the 2 screens, and the new model was whiter. I then turned the page on each device a few times and the screen on the new model was grayer. I don’t really understand it either but that is what I saw. That makes perfect sense if you have partial page refresh enabled. I’d bet the screen will stay whiter if you set it to full refresh and live with the black flash. If the Carta screen is (for the moment) not a clear improvement then the new Kobo Aura looks really good again (though apparently its light is not as great as Aura HD’s, which is hard to understand). Mine came on Monday and I’m more than happy with the purchase. I did not get the first PW to replace my Touch. I had looked at it in the store and wasn’t impressed enough to buy. I thought the 1st go was an improvement over the Touch and I did like it; just not enough to upgrade. I recall reading your review, Nate, about the unevenness in the light and I found that to be true when I tested it out in the store. But by the time gen 2 came around, I figured (a) they’ve had plenty of time to improve, and (b) I need an upgrade. I’m definitely pleased, and I found the screen to be very evenly lit. It was worth the upgrade. And my wife is happy that the search beacon from the Touch will no longer be shining in her face when I read in bed. Thank you for this review and for the link to your competitor. I’m the one percent of one percent and my wants are irrelevant I know, but all I care about is the screen. I want it whiter, the text darker, and the contrast greater. I’m disappointed. But thanks to these two articles at least I’m not disappointed, frustrated, and out cash 🙂 Thanks again! One huge improvement I have noticed is that the updated processor can now index books in no time flat. I agree with your title and opinion, and I disagree with your competition’s opinion. I do feel it is very much worth upgrading to the new model. It is MUCH better. I see no improvement in the new gen display (carta) when compared to the previous gen display with front-light turned off. I have them side-by-side. The display is no whiter; the contrast is about the same. However, the front-light is different story. Uniform. Almost perfect. 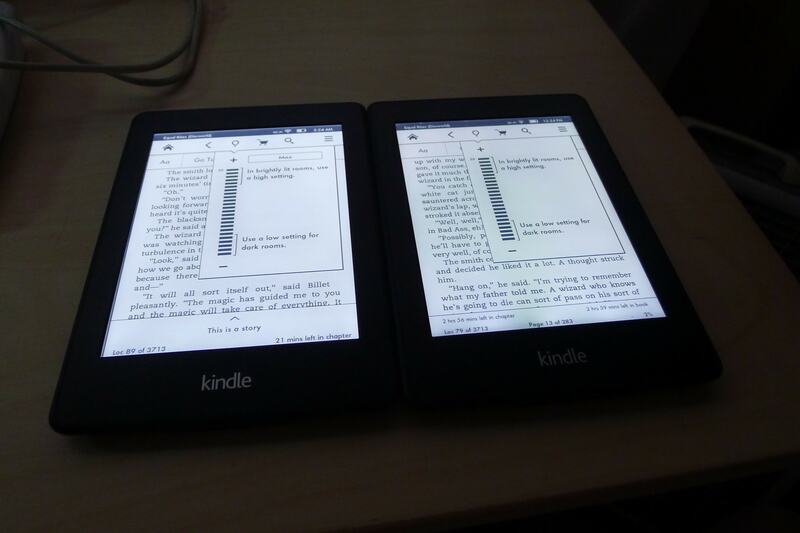 ok, what about 2013 paperwhite vs kobo aura? I haven’t had a chance to get my hands on a Kobo Aura.